Ambient computing is Scott Dunlap's jam, smartphone companion apps are the enemy. The chief product officer at smart home startup Brilliant Home Technology, founded by serial entrepreneur Aaron Emigh in 2014, doesn't think $50,000 and cutting into your walls should separate the two. "Aaron realised that the more smart home products he had in his house, the more he was going to hate his house," Dunlap told us. "And that's largely because you have to reach for your phone for every interaction. If I want to change the heating, I get my phone. If I want to put music on, I'm looking at my phone. "We were looking for a controller that you can talk to or touch a screen, use motion controls, all the ambient computing ways that you'd want to interact with a room. And of course, nobody was selling one apart from very high end systems like Crestron." The answer is a win for simplicity. Brilliant's smart home controller, starting at $199, replaces your light switch panel on the wall and can apparently be installed in five minutes. 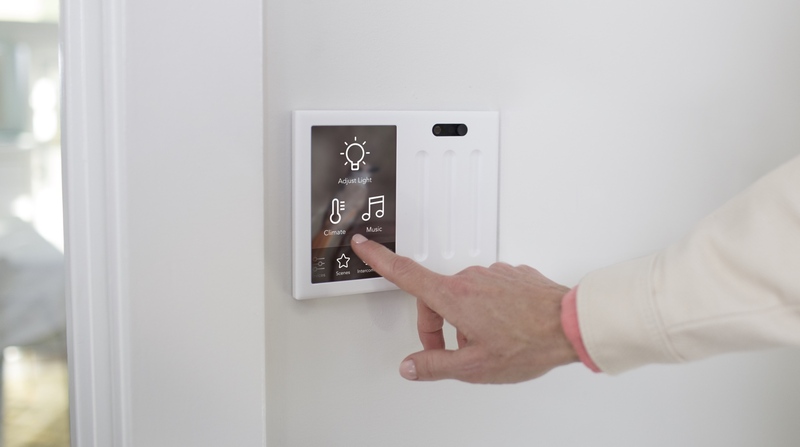 There's a 5-inch, HD touchscreen and the controls you can tweak and slide for smart lights, speakers and thermostats change from room to room depending on what connected tech you have around the house. A video camera turns the devices into intercoms when you buy more than one or connect to a Ring doorbell and motion detection automatically turns smart lights on and off. With SmartThings and IFTTT integration, Brilliant will work with all the big home tech names: Philips Hue, Nest, Honeywell & Sonos. The design is intentionally less "early edition iPod hanging on your wall" and more like a good old-fashioned light switch. Dunlap wanted something that can hide in the background of the room, with art or family photos displayed when not in use. Not to mention that the screen, which can also be used to set up custom scenes, will help with discovery: "That's something that voice services have struggled with." Then there's Alexa. This is another device with Amazon's Alexa Voice Services built in. "We have our own voice service - you can say 'Hey Brilliant' to wake up the kids, turn on lights and music. So we began with our own voice interaction but then we ran into a lot of households that have really embraced Alexa," he explained. "What they liked about Brilliant is - this isn't even a Dot taking up room on an end table or taking up an outlet. You can have Alexa in the room without another device there." Despite Alexa's clear popularity, the team would be happy to get more voice assistants onboard with its controller, particularly Google Assistant, though it has noted that Siri and HomeKit are much further down in the conversation with families in its pilot program. This open ethos to voice controls will also come in handy if and when Amazon releases its rumoured Echo 2 with a large touchscreen, though Dunlap says he isn't worried as it's very unlikely Amazon is going to go for the light switch space in the home too. The Brilliant controller is up for pre-order now with shipping set for "late summer", which likely to be sometime around the end of August to September. It will join the growing number of innovative devices trying to take the pain out of smart home interactions which includes the Sevenhugs smart remote, which raised $1.1 million in crowdfunding in late 2016. There will be two main areas of focus for the rest of 2017 for the Brilliant team - half smartphone, half traditional home engineers. First, it will be working with security partners, which Dunlap won't name yet, as there's a potential for it to work as a smart security cam too. Then the plan is to roll out software updates to make Brilliant an even more delightful and fun product. That means appealing to home automation nerds as well as beginners. "If you have kids, or guests, in most cases, there's no way for them to adjust things right now," he said. "We've found that early adopters want The Jetsons, they want their home to know everything and do everything for them but a large majority of the folks buying smart home products now just want simplicity, they own two or three products and they want to be able to access it on the wall." In the pilot program, controlling music and lights were the most popular use cases and Sonos users, in particular, were pretty excited about the new voice and touch setup. "And a whole bunch of people are telling me: I just want it for smart lighting and the pretty pictures. And I say, OK, that works."